C. Hall Thompson's name came up the other day while I was writing about Viking stories. He didn't write any Viking stories that I know of, but he did write a few Northerns--the Alaskan and Canadian type, not the Viking type--and several Westerns. He also wrote four stories for Weird Tales. While looking into his life and career, I came across an interesting bit of speculation put forth on the Internet. I'll get to that in a minute. 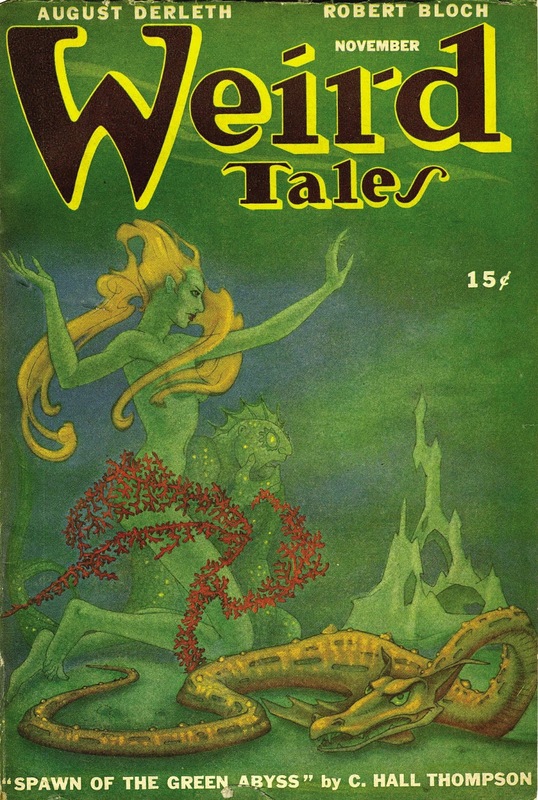 C. Hall Thompson and Weird Tales made their debut in the same month, March 1923. He was born on St. Patrick's Day and was christened almost three months later, on June 10, 1923, at Tabor Presbyterian Church in Philadelphia. His baptismal name was Charles John Thompson. The Charles part came from his father. Before he was even out of high school, Thompson, a budding author, had adopted a pseudonym: from at least 1942 until the closing out of his career, he called himself C. Hall Thompson. The Hall part came from his mother, Helen Hall Thompson. Thompson graduated from South Philadelphia High School for Boys in June 1942. He would have been a year older than his classmates, but I don't have an explanation for his delayed graduation. Even then he was a writer, for Thompson penned the review of his graduating class, calling it "Southern for Service." He may have been the Charles J. Thompson who, as a student at Vare Junior High School in Philadelphia, won second prize (junior group) and the grand sum of $3 for his entry in the National Peace Poster Contest in March 1938. Despite his efforts, war came to Europe a year and a half later. Although Thompson was of an age to serve when America went to war, I don't know that he did. However, he filled out a draft card in 1942 while residing in Philadelphia. All have been reprinted again and again and a couple have even been translated and published in European editions. Thompson's popularity as a teller of weird tales can be attributed in part to his authorship of some of the first Cthulhu Mythos stories told after the death of H.P. Lovecraft--told, that is, by someone other than members of Lovecraft's circle. (Lovecraft died two days before Thompson's fourteenth birthday.) There is a story on the Internet that August Derleth threatened Thompson with legal action if he did not cease writing tales set in a Lovecraftian universe. That story arrives without citation or attribution, but it would seem to go along with Derleth's reputation. (The more I read about him in regards to Lovecraft, the less I like him: Derleth seems to have been a man who loved something so much that he thought it was his.) Chased away from Weird Tales or not, Thompson sold nearly four dozen stories to Adventure, Argosy, Dime Western Stories, Frontier Stories, North-West Romances, 10 Story Western Magazine, and other titles, mostly Westerns, over the next six years. He also broke into the slicks with stories in Collier's and Esquire. Thompson's magazine stories were published between 1945 and 1954 when their author was in his twenties and early thirties. Then, in the same year that Weird Tales came to an end, Thompson's magazine credits seem to have dried up. Pulps in general were dying off by the early 1950s, but Westerns were still strong, in paperback, at the movie theater, and on TV. Thompson had a few Westerns published in the 1950s: A Gun for Billy Reo in 1955, Under the Badge in 1957, and Montana! in 1959. Ace Double Editions issued Thompson's Western novel The Killing of Hallie James in 1969. Thompson is also supposed to have written stories for Sunday newspaper sections. There is speculation online that C. Hall Thompson was the pseudonymous author of "The Dunstable Horror" (Apr. 1964) and "The Crib of Hell" (May 1965), both in Fantastic Stories of the Imagination. (That thread appears on the website Thomas Ligotti Online, here.) Not very long ago (in geologic terms) I was working on some research to do with Lee Brown Coye. As it turns out, Coye illustrated "The Dunstable Horror," a serviceable pastiche of Lovecraft (and far superior to Derleth's own novel The Lurker at the Threshold, from 1945). This was Coye's final work for Fantastic. By 1964 he had already begun working for Derleth and Derleth's Arkham House. 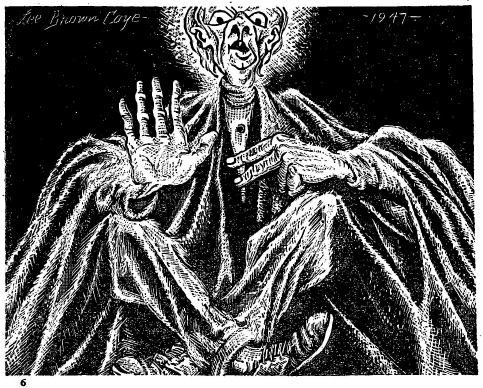 Coye had previously illustrated "The Will of Claude Ashur" and "Clay" by Thompson in Weird Tales. If Pendragon was indeed a pseudonym of C. Hall Thompson, then Coye would already have been familiar with his work. In the summer of 1951, Thompson married Italian-born Isabella Elda Pirritano (1924-2009), a recent graduate of Temple University who had studied secondary education. She was also a choral singer. I don't know anything about their lives nor their long years together after 1969. Charles J. Thompson died on February 11, 1991, and was buried at Arlington Cemetery in Drexel Hill, Pennsylvania. His wife survived him by nearly two decades and was laid to rest beside him in 2009. None except to read Thompson's stories. C. Hall Thompson's first story for Weird Tales, "Spawn of the Green Abyss," from November 1946, was also his first and only cover story. The cover artist was the unfindable Boris Dolgov. His technique was unusual for a pulp cover, as it appears to be a pencil drawing tinted with watercolors. Lee Brown Coye illustrated Thompson's next story for "The Unique Magazine," "The Will of Claude Ashur," from July 1947. This was also the first issue in which Coye's "Weirdisms" feature began in Weird Tales and the first in which the Damp Man, created by Allison V. Harding, appeared. Despite the eventual popularity of the Damp Man stories, Thompson had the lead story in that July 1947 issue. 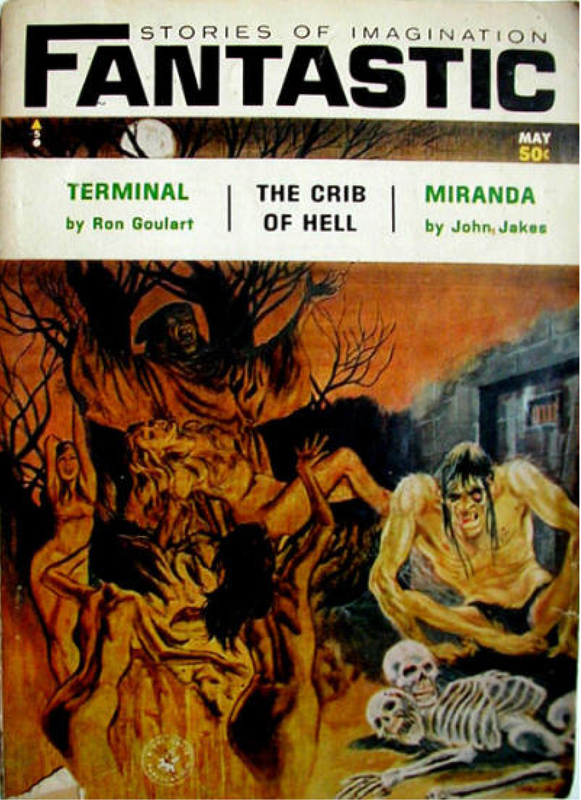 I don't know whether "The Crib of Hell" by Arthur Pendragon was the cover story in the May 1965 issue of Fantastic Stories of the Imagination, but I wanted to show the cover because I have detected a swipe, unfortunately made by an otherwise great and very admirable artist, Gray Morrow. You can see for yourself how oddly divided this image is. The part on the right is likely original. The part on the left, executed in an entirely different technique, is obviously a swipe. See the two images below. There is at least one person, by the way, who has speculated that Thompson and Pendragon were the same person. More on that in the next posting. 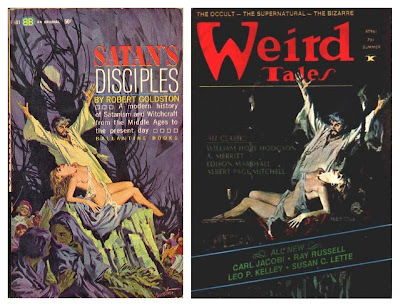 At the left is Jack Thurston's cover for Satan's Disciples by Robert Goldston (1962), and at the right is another artist's swipe done for the summer 1974 issue of Weird Tales. Who knows where the late Mr. Thurston's artwork will show up next? Update (Jan. 22, 2019): I have been thinking about this image, and it occurs to me that all of the artists who created versions of it may have been guilty of swiping it from an original source, Jack Thurston included. But what would the original source have been? The pulp magazines did not pay enough for their illustrators to afford models (I am sure this is true for magazine and paperback covers as well). So, the artist had to make do with whatever sources were available for free. Photo magazines were a good source; you can see recognizable images of Clark Gable and Raymond Massey peaking out from the pages of Doc Savage and Weird tales. An artist friend of mine used to make a hobby of collecting photo magazines that Virgil Finlay has used a source material. Those days seem to have been less concerned about intellectual property rights than our own.